Every week we pull together some great Canadian recipes from Canadian food bloggers around the web featuring one main ingredient or dish. This week we're sharing a homemade favourite - sticky bun recipes! Sticky buns are a comforting homemade treat - and they are always better homemade, hot out of the oven with warm sticky glaze. There's the classic cinnamon bun but we have so many other great variations - everything from a one minute wonder to buns you can freeze unbaked until you need them, not to mention countless flavour combinations. They're perfect for a special brunch or breakfast or for a mid-afternoon treat, or a post dinner dessert! **[Strawberry Sticky Buns](http://www.breakfastfordinner.net/strawberry-sticky-buns/)** with Lemon Glaze are a perfect fresh take on the classic sticky bun. From **Breakfast for Dinner**. A perfect cup of coffee with a **[Peach Pecan Cinnamon Bun](http://thefoodblog.net/peach-pecan-cinnamon-buns/)** is a perfect mid afternoon break! From **The Food Blog**. 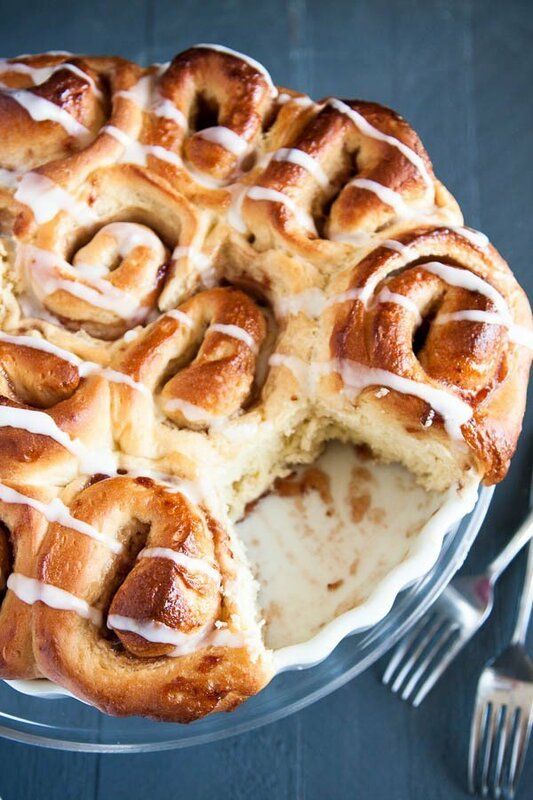 Classic Cinnamon Buns You Can Freeze! This is a freezer friendly recipe - you can freeze the buns unbaked and and take them out of the freezer when you're ready to make these **[Classic Cinnamon Buns](http://strawberriesforsupper.com/cinnamon-buns/)**. From **Strawberries for Supper**. Why settle for a peanut butter and jelly sandwich when you can have a **[Peanut Butter and Jam Sweet Roll](http://leelalicious.com/peanut-butter-jam-sweet-rolls/)**? From **Leelalicous**. A more "adult" version of the sticky bun: **[Mini Rum Butter Cinnamon Rolls](http://www.simplystacie.net/2015/11/mini-rum-butter-cinnamon-rolls/)**. From **Simply Stacie**. These **[Maple Cranberry Cinnamon Rolls](https://crumbkitchen.com/maple-cranberry-cinnamon-rolls/)** should become the official Canadian sticky bun! From **Crumb Kitchen**. When you need a really quick sticky bun fix - **[One Minute Cinnamon Roll In a Mug](https://avirtualvegan.com/one-minute-cinnamon-roll-in-a-mug/)**. From **A Virtual Vegan**. **[Lemon Sticky Buns](http://nonnasway.com/lemon-sticky-buns/)** - a quadruple lemon threat with lemon zest in the dough, lemon curd filling, lemon syrup and... lemon frosting! From **Nonna's Way**. Loaded with caramel and pecans, nothing beats a classic **[Grandma's Caramel Sticky Buns](https://kitchendivas.com/grandmas-caramel-sticky-buns/)** recipe. From **Kitchen Divas**. Lemon and raspberry are a perfect flavour combo and we love these **[Lemon Raspberry Sweet Rolls](http://bakeeatrepeat.ca/lemon-raspberry-sweet-rolls-recipe/)**. From **Bake. Eat. Repeat**. Click on the photos to go to the recipe! A big thank you to all our FBC Members who participated in this weekend's sticky bun recipe roundup.